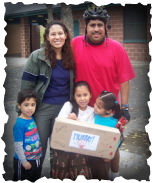 MTR Charities, Inc. invests procedes from the Mission to Mission Charity Bike Tour into the community through M2M Mini Grants. These grants are awarded yearly to non-profits providing services to neighborhoods in the San Antonio area. The normal range of these grants is $100-$1500; the final amounts of these grants is determined by the procedes from each year's M2M Charity Bike Tour. To be considered for a M2M Mini Grant, non-profits must download and return a M2M Mini-Grant application and supporting information by the stated deadlines. 2018-19 Grant applications must be completed between July 1st and August 31st; acceptance notification September 30, 2018. On December 3, 2016 three hundred began to gather when the skies opened flooding tour roadways, the San Antonio River, and low water crossings. While the M2M tour had to be cancelled for safety concerns, contributions from our riders funded more than ten local charity projects. Thanks to all you dedicated riders, volunteers, and family supporters who made the event a resounding community success story. MTR Charities, Inc. is a 501(c)(3) tax-exempt organization organized by The Rotary Club of San Antonio Mission Trail. MTR Charities,Inc. conducts fundraisers and distributes the proceeds for charitable and educational purposes. MTR is qualified to receive tax-exempt donations.